Voting for a healthy planet for future generations is a responsibility that extends well beyond Congress. While we here at the NRDC Action Fund are focused on greening Congress, this election cycle, we’ve also identified 11 ballot initiatives, all in western states, that will make a real difference in each state. Here, in alphabetical order, are our state and local ballot initiative recommendations. Whatever you do, please remember to VOTE and get your friends and family to vote, too. Proposition 127 – YES. 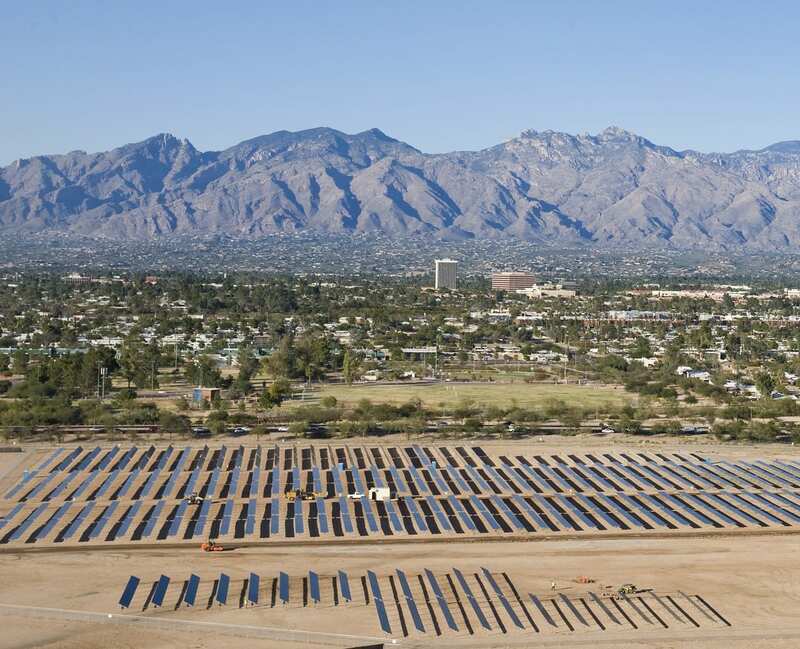 This measure would jump-start Arizona’s clean energy economy by expanding the state’s Renewable Portfolio Standard from 15% by 2025 to 50% by 2030 via constitutional amendment, adding Arizona to the important group of states that are making bold commitments to clean energy. Proposition 127 would open the door to thousands of clean energy jobs in Arizona, and Arizonans would save more than $4 billion in energy costs by switching to cleaner, cheaper energy sources. Proposition 1 – YES. Locating housing near transit helps reduce carbon pollution, helping California meet its ambitious climate goals. Proposition 1 will serve as a catalyst to kick-start sustainable housing construction. This initiative is part of a broader state policy package to increase housing affordability and accessibility in line with smart growth principles. Proposition 6 – NO. Transportation accounts for over 40% of all carbon pollution in California, but this cynical proposition would turn back the clock on much-needed transit and transportation improvement projects already underway in communities across the state. Proposition 6 is a reckless referendum on the state’s longstanding fuel tax system that could cost California 68,000 jobs each year and jeopardize repairs of at-risk roads and bridges. Sound transportation policies must be part of California’s climate action efforts, but Proposition 6 takes the state backward. Proposition 12 – YES. Food production has a major impact on the environment and climate. This measure would improve animal husbandry practices for eggs, veal and pork production, which would in turn help reduce antibiotic use in the livestock sector, fix loopholes in existing law and require food production operations to meet new standards. Los Angeles County Measure W – YES. Drought is a pervasive issue in California, but the state’s most populous county is taking bold action with Measure W, which would create the Safe Clean Water Program. The program would raise $300 million a year to modernize the county’s water system by capturing more rainfall, filtering pollutants and storing clean water for future use. As the most densely populated urbanized area in the United States, this policy would put Los Angeles County in a more secure position as its population grows and as the Earth’s climate continues to change. Amendment 74 – NO. This measure, backed heavily by fossil fuel industries, is an attempt to confuse voters and make it harder to preserve pristine landscapes from drilling and fracking. Amendment 74 would upset long-established land use law by limiting the ability of communities to regulate industrial development to protect public health and safety. Its language is so broad that, if it passes, it would make it extraordinarily difficult for local Colorado governments to perform some of their most basic responsibilities to protect public health and the environment. Proposition 112 – YES. This statutory initiative would protect people and their communities from dangerous and polluting energy sources. By establishing a 2,500-foot buffer zone between new oil and gas operations and vulnerable areas such as homes, schools, water sources and playgrounds, Proposition 112 would provide a significant boon to Colorado’s public health. Oil and gas industries have invested an astonishing $21 million to block this initiative, making this race almost as expensive as the race for governor. Question 3 – NO. This measure would amend the state constitution to deregulate Nevada’s energy market. Despite what Question 3’s proponents are selling, the passage of this initiative would actually severely disrupt Nevada’s energy market. And NV Energy, which provides 90% of Nevada’s power, would be able to abandon its clean energy plans. Question 6 – YES. The Renewable Energy Standards Initiative would increase Nevada’s renewable energy requirements from 25% by 2025 to 50% by 2030 via constitutional amendment. This amendment would open the door to significantly lower energy costs and thousands of clean energy jobs, and it’s looking like Nevadans are excited to reap these benefits. According to a Nevada Independent poll from April, voters in Nevada overwhelmingly approve of Question 6 and there is no political activity committee opposing the initiative. Measure 104 – NO. Oregon leaders are committed to taking up cap and invest legislation in early 2019 to put a price on carbon. But if Measure 104 passes, that climate policy leadership would be mired in a cumbersome legislative process. This initiative would require an unwieldy three-fifths majority in both legislative chambers for any proposal that would result in any state revenue increase, giving a minority of stubborn state legislators the power to block decisive climate action. Initiative 1631 – YES. The state of Washington is proposing the bold action to put a price on carbon pollution. If approved, Initiative 1631 would enact a carbon emissions fee of $15 per metric ton of carbon beginning in 2020 and increase the fee by $2 per ton each year until the state’s greenhouse gas reduction goals are met. Revenue from this fee—about $1 billion a year—would be invested in clean-energy infrastructure, managing Washington’s natural resources and preparing the state’s communities for climate change. Initiative 1631 has broad support among environmental groups, NRDC included, but it also faces an overwhelming fundraising disadvantage as the oil industry is bankrolling the opposition. Once again, industry polluters are opposing robust climate action to preserve their own profits, but we can’t let them succeed. States can make a big difference to act on climate and manage natural resources wisely in the face of climate change. Please make your voice heard. Pledge now to vote for environmental initiative and champions up and down the ballot. On November 6th, let’s make history with bold policies in states across the west. Annie Notthoff is a senior adviser to the NRDC Action Fund.